Aretha Franklin, the Queen of Soul whose prodigious vocal gifts and landmark recordings in the 1960s and early ’70s, such as “Respect” and “(You Make Me Feel Like) A Natural Woman,” made her a voice of an era and an awe-inducing if sometimes enigmatic presence in American popular culture for more than half a century, died Thursday at her home in Detroit. She was 76. The cause of death was advanced pancreatic cancer. The list of Ms. Franklin’s accomplishments and accolades is vast. She won 18 Grammy Awards, as well as a Grammy Lifetime Achievement Award and Grammy Living Legend honor. Fourteen of her singles sold a million or more copies, the most of any female recording artist. A Kennedy Center honoree in 1994, she was the recipient of the National Medal of Arts, in 1999, and the Presidential Medal of Freedom, the nation’s highest civilian honor, in 2005. She was the first woman elected to the Rock and Roll Hall of Fame, in 1987. She sang at Obama’s first presidential inauguration. 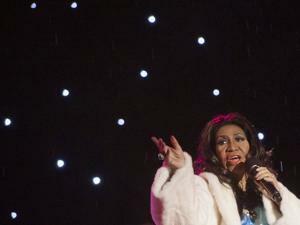 Yet that starry résumé isn’t as impressive as what earned Ms. Franklin such honors: her singing. In 2008, Rolling Stone magazine named her the greatest singer of the rock era. It was not a controversial selection. Ms. Franklin’s sumptuous mezzo-soprano, with its four-octave range, was one of the glories of popular song: a force of nature equally suited to pulpit grandeur and silken delicacy. “An untutored genius, the best voice I’ve heard since Billie Holiday,” said John Hammond, the discoverer of Holiday, Bob Dylan, and Bruce Springsteen, among others, when he signed her to a recording contract. Ms. Franklin’s dynamic range, from full-throttle roar to hushed groan, was rivaled only by her expressive and stylistic range. Within the same song — within the same chorus — she could be commanding, beseeching, and playful. Ms. Franklin excelled at them all, as well as pure gospel, standards, rock (she had hits covering “Eleanor Rigby” and “Bridge Over Troubled Water”), and the slick pop that brought her back to commercial prominence in the 1980s. She even ventured into opera, in 1998, triumphantly singing Puccini’s “Nessun dorma” as a last-minute fill-in for an indisposed Luciano Pavarotti at the Grammy Awards. Yet Ms. Franklin’s remarkable versatility deferred to her signature style. Soul was what made her a legend, and soul was what she sang as well as anyone ever has. On his Atlantic recordings of the 1950s, Ray Charles famously joined sacred and secular, creating soul music: a deeper, richer, more powerfully expressive version of rhythm and blues. Ms. Franklin brought a further dimension to soul music. Moving it into the realm of racial and sexual politics, she made it at times almost unnervingly personal. It was only fitting that she and Charles would share an epic duet on Ms. Franklin’s 1971 “Live at the Fillmore West” album. Ms. Franklin performed in Boston at the “Summerthing Sunset Series on the Common” in September 1971. Charles’s music marked soul’s emergence into the culture at large, Ms. Franklin’s its recognition, even acclamation, by that culture. Starting in 1967, with the release of “I Never Loved a Man (the Way I Love You),” and lasting through, say, “Spirit in the Dark,” in 1970, she embodied — and gloriously exploited — a rare convergence of ability, artistry, and era. The ability had been evident from Ms. Franklin’s first recording, at 14, “The Gospel Sound of Aretha Franklin.” The artistry had been obscured by the often-unsuitable material and elaborate arrangements Columbia Records had imposed on her earlier in the ’60s. “They wanted to turn Aretha into Diahann Carroll,” Atlantic’s Jerry Wexler said of Columbia. Besides Charles, Atlantic had also recorded some of the best African-American singers of the ’50s and early ’60s: Big Joe Turner, Ruth Brown, Ben E. King, Wilson Pickett. Ms. Franklin’s arrival there seems in retrospect inevitable as well as fitting. The move unleashed Ms. Franklin. Wexler brought her together with a group of Southern session men — “a rhythm section of Alabama white boys who took a left turn at the blues,’’ he said. More important, he made Ms. Franklin, a gifted pianist, her own accompanist. 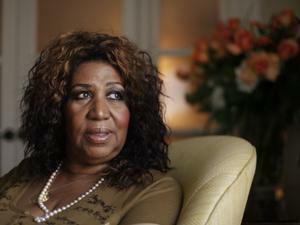 “Putting me back on piano helped Aretha-ize the new music,” she later said. 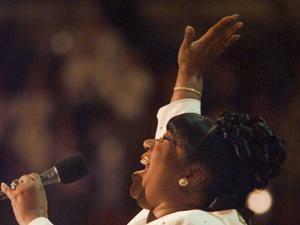 Ms. Franklin sang the National Anthem at the Democratic Convention in Chicago in 1996. The tight, stripped-down arrangements on these recordings worked to complement, rather than compete with, the sheer voluptuousness of Ms. Franklin’s voice. Even when an arrangement was elaborate, as on “(You Make Me Feel Like) A Natural Woman,” the strings, horns, and backing singers function as rhythmic elements, working to accent rather than sweeten or cushion the music. The times scorned sweetening and cushioning. So much of Ms. Franklin’s power had to do with when she made these recordings, as well as how ably. When she sang “R-E-S-P-E-C-T/Find out what it means to me,” it was the spelling lesson as political manifesto. And the song carried more weight than when its composer, Otis Redding, had sung it. Ms. Franklin’s being a woman made her demonstration of black pride seem both less threatening and more universal. ‘‘Her songs were songs of the movement,’’ said Andrew Young, who was a lieutenant for Martin Luther King Jr. before becoming UN ambassador and mayor of Atlanta. And when the movement was flagging, Young said, Ms. Franklin lent her time, money, and, most critically, her voice. 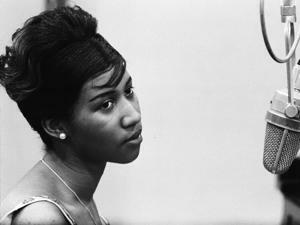 Michael Herr, in his classic book of Vietnam reportage, “Dispatches,” suggests the scale of the power of Ms. Franklin’s singing when he describes the conflict as “a war where a lot of people talked about Aretha’s ‘Satisfaction’ the way other people speak of Brahms’ Fourth.” Ms. Franklin, no less than Johannes Brahms, required only one name for immediate recognition. Ms. Franklin performed during the National Christmas Tree Lighting ceremony on the Ellipse adjacent to the White House in Washington, D.C., in 2013. “(You Make Me Feel Like) A Natural Woman” is ostensibly a tribute to a male lover who has made the singer feel more “natural” and womanly. Yet so forceful and moving is Ms. Franklin’s singing that the only way the performance makes sense is if the “you” that recurs throughout the song is self-addressed, and deservedly so. The lyrics say one thing, Ms. Franklin’s voice says quite another. Ms. Franklin’s music so often managed to sound celebratory yet shot through with grief. In her life, she was no stranger to sadness, even tragedy. Her parents separated when she was 6, and her mother, Barbara (Siggers) Franklin, died when her daughter was 10. Ms. Franklin became a mother at 12 and again a few months later. Her first husband, Ted White, was abusive. Her father, shot by burglars in 1979, died after spending five years in a coma. Ms. Franklin, who was married twice, leaves four sons, Clarence, Edward, Kecalf, and Ted White Jr.; three stepchildren, from her second marriage, to actor Glynn Turman; and four grandchildren. Two sisters, Carolyn and Erma, who were backup singers for Ms. Franklin, and a brother, Cecil, predeceased her. The same musical environment that produced Motown shaped Ms. Franklin. Berry Gordy, the label’s founder, tried to sign her. The future members of the Four Tops were friends of Ms. Franklin when she was a girl. Smokey Robinson was a close friend of her brother Cecil. Yet Ms. Franklin was both apart from and above her fellow Detroiters. The future Lady Soul was a child of African-American aristocracy. 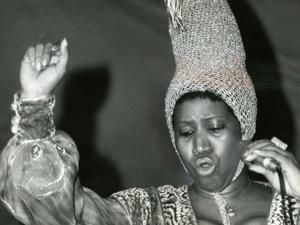 Aretha Louise Franklin was born in Memphis, on March 25, 1942. The family moved to Detroit, where her father, Rev. C. L. Franklin, led the 4,500-member New Bethel Baptist Church. Known as “the High Priest of Soul Preaching” and “the man with the million-dollar voice,” Franklin was so popular a preacher that no fewer than 76 of his sermons were released as recordings. Ms. Franklin, who sang her first solo in church at 12, grew up in a world where religion, music, and show business easily mixed. Among visitors to the Franklin home were the gospel singers Mahalia Jackson and Clara Ward (Ms. Franklin cited Ward as “the great musical influence of my early childhood”), the R&B singer Dinah Washington, and Sam Cooke. The example of Cooke’s highly successful move from gospel to pop was not lost on Ms. Franklin. Ms. Franklin during her first recording sessions at Columbia Records in 1960. Starting in 1961, she released 10 albums on Columbia. Ms. Franklin shared an arranger with Barbra Streisand, and her only Top 40 hit was the Tin Pan Alley chestnut “Rock-a-Bye Your Baby with a Dixie Melody.” Even so, Ms. Franklin showed glimmers of her future success. She recorded a memorable tribute LP to Washington, and the Smithsonian Institution later chose her raise-the-roof rendition of Johnny Mercer’s “Ac-cent-tchu-ate the Positive” for its collection of definitive recordings of the Great American Songbook. “I wanted a hit,” Ms. Franklin wrote in her autobiography, “and I wanted to be with a company that understood the current market.” She got it with Atlantic. By 1972, though, when she released one of her most magnificent recordings, “Amazing Grace,” a return to her gospel roots, a commercial and artistic decline set in. Disco was one of the few styles that eluded Ms. Franklin. The times seemed to have left her behind. The singer of Steely Dan’s 1980 song “Hey, Nineteen” has to identify her voice to his young girlfriend, “That’s ’retha Franklin.” In true diva fashion, Ms. Franklin regarded the reference as insult rather than tribute. That same year she made her movie debut, in “The Blues Brothers.” Ms. Franklin’s galvanic rendition of “Think” thrust her back into the public eye. Also in 1980, she switched labels, to Arista. Such recordings as “Jump to It” and “Freeway of Love” put her back atop the charts — and, in the case of “Freeway,” on MTV. “I Knew You Were Waiting (for Me),” a duet with George Michael, became only her second recording, after “Respect,” to reach No. 1 on the pop charts.